Think your kids are super heroes? Wait until you see the Justice League 5 in 1 castle! 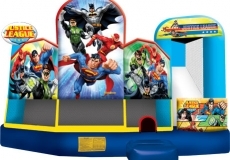 With five activities to choose from, kids can practice their superhero skills alongside the Green Lantern, Batman, Superman, Flash and Wonder Woman. 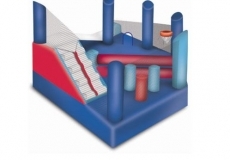 Come help save the world – perfect for birthdays, community, sporting & corporate events. 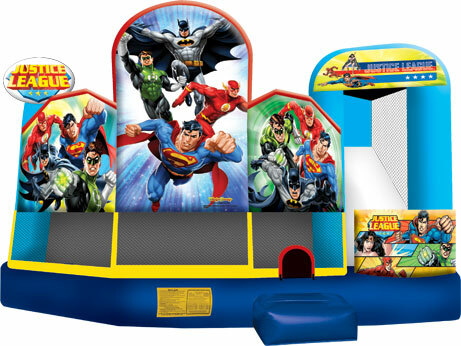 The Justice League 5 in 1 Jumping Castle has a large Jumping Section, a basketball hoop, barriers to climb through, three pop up punching bags, stairs and a super slide.